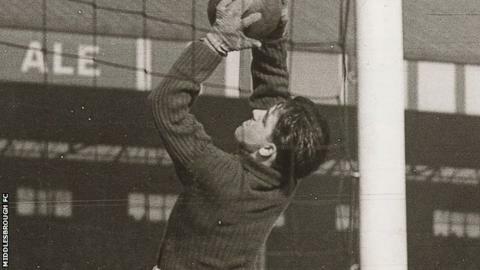 Middlesbrough have announced the death of former goalkeeper Rolando Ugolini at the age of 89. Ugolini, who made more than 300 appearances over nine years following a move from Celtic in 1948, died suddenly at his home in Edinburgh on Thursday. He also represented Wrexham, Dundee United and Berwick Rangers during his playing career. "Middlesbrough was Rolando's club," his widow Irene said. "He was very proud of the club." During his time at Ayresome Park, Ugolini was a contemporary of favourites such as Wilf Mannion, George Hardwick and Brian Clough.